From the newest edition of the Rockstar Newswire, the official online newsletter for the makers of Grand Theft Auto: "We are working on a second trailer - unfortunately Hurricane Sandy has derailed our plans somewhat but we will have something to show soon. Its hard to be precise as we have no power whatsoever in our New York office. We hope everyone else in affected areas is doing okay." 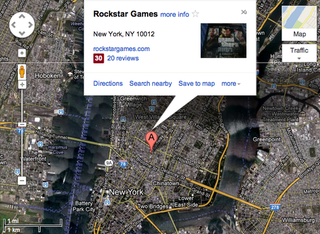 Totally understandable when you consider that Rockstar's main offices, where they write the games, oversee development and I think make the trailers, is in the part of lower Manhattan that is currently in its third day of blackout with power not expected to be restored for another couple of days. Our headquarters, the home offices of Gawker Media, are just a few blocks from Rockstar's and are also without power and not conveniently accessible by mass transit any more. All of the chunk of Manhattan that you can see in the above Google Map satellite image is blacked out, with no subway service. The first trailer for GTA V was released on November 2, 2011, almost exactly a year ago. The game is scheduled for a Spring 2013 release on Xbox 360 and PlayStation 3.